Take the roller brake test at MOT. Getting an MOT pass is just the start of it. The MOT is the minimum standard. Your maintenance programme should do much more. For example, there are potential details on a roller brake test report that could indicate a defective component or impending failure. And it’s possible for characteristics within the system to change how it will perform, such as the fitment of non OE friction components. Roller brake tests only assess the capability of a braking system in the conditions you test in. If you test a vehicle empty, then load it, the braking system’s being asked to deliver much more when it’s carrying that load. 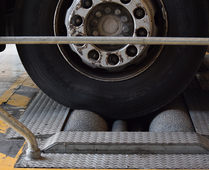 DVSA’s guide to heavy vehicle brake testing says that axles should be loaded to at least 65% of their design weight for testing. Trucks, and trailers particularly, can have very dramatic laden to unladen weight ratios. 3:1 is common for a tractor unit, 5:1 is not unusual for a trailer. If you find the wheels are locking out early – well before the expected performance figures have been reached (even for buses and coaches) – some form of additional loading is needed to get a worthwhile brake test. Performing a good test is vital. So keep your brake rollers well gritted and dry. But you also need to analyse the brake test printout carefully. Meeting the MOT figures is just the first stage. You need to compare the figures across axles, when wheels haven’t locked. are the figures as high as they usually are? is one vehicle performing differently to a sister vehicle in your fleet? is there any difference from the norm is a cause for investigation? Doing this means the roller brake test will complement the PMI. You’ll build confidence in the braking system – that it’s really “in good and efficient working order and properly adjusted”. This is what the law, and your operator’s licence, requires.